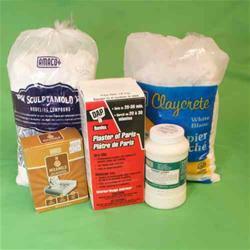 Amaco Claycrete Instant Papier Mache 20 lb. ComposiMold Bubble Buster 16 oz. ComposiMold Bubble Buster 6 oz. ComposiMold Reuseable Molding Material 10 oz. ComposiMold Reuseable Molding Material 20 oz.